It's hard to believe that gloriously beautiful, trumpet-shaped lilies grow from plump, scaly bulbs. The exquisite flowers sit atop tall, straight stems, and gardeners prize them for their beauty, their long bloom and also the very minimal care they require. Both Asiatic and Oriental lilies are true lilies, belonging to the genus Lilium. Some flowers carry "lily" in their common names, like day lilies, calla lilies and peace lilies, but are not true lilies. True lilies grow from scaly bulbs and are perennials. Lily hues range from pale to vivid. True lilies grow from bulbs, not seeds. The bulbs have fleshy, overlapping scales without a protective covering, and to grow, they require a cold dormant period. Therefore, they don't usually do well in warmer zones. True lilies thrive in U.S. Department of Agriculture plant hardiness zones 4 though 8. Most require well-draining, acidic or neutral pH soil enriched by organic material. Bulbs should be planted in the fall at a depth of three times the height of the bulb. 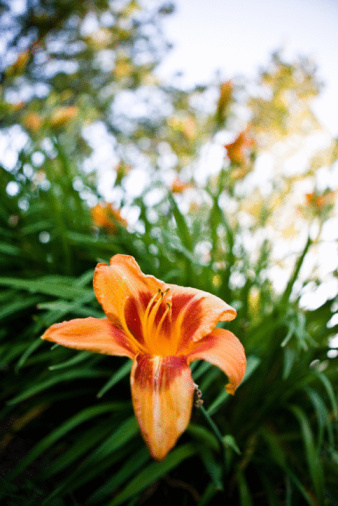 True lilies produce their dramatic flowers on stiff, strong stems that grow from the bulbs. Different varieties have different stalk heights, ranging from 2 feet to 6 feet tall. Once established, they are perennials and return, year after year, during their growing season. You'll find lily cultivars that produce white flowers, along with those that have yellow, pink, orange or maroon. Blossoms can be shaped like trumpets, bowls or bells. Some nod downward, others face outward or turn upward. Many produce a delightful fragrance. Each type of lily blooms in a different period. Some are early season flowers, other midseason, and some late season. By deliberately selecting lilies for their bloom dates, you can have lilies gracing your garden from early summer through autumn's first frost. Which are the first lilies to bloom? They are likely to be Asiatic lilies, and they also happen to be the easiest lilies to grow and care for. Asiatic lilies are very cold hardy (down to USDA hardiness zone 4), and their tall stems do not require staking. These lilies are very accepting of soil types and grow in almost any soil, as long as it drains well. They bloom early in summer until midsummer. Asiatic lilies have flowers that face upward. You can find Asiatic lily cultivars in a wide range of shades, from white to deep shades of yellow, orange and red. Unfortunately, over time these hybrids have lost most of their perfume. If you long for the deep, intoxicating fragrance of a lily, it's probably an Oriental lily you are dreaming of. The exotic blooms of Oriental lilies are wildly popular, with their frilly flowers and heavy, sweet perfume. These exceptionally beautiful flowers bloom right after the Asiatic lilies fade. They start flowering in midsummer and keep on going until late summer. Orientals come in many sizes, from bite-size plants topping out at 2 feet tall to giants towering well above the average gardener's head. Striking and dramatic, Oriental lilies make wonderful cut flowers. One vase will fill the entire house with the unforgettable scent. And in the garden, you'll find that the fragrance intensifies after dark. Lilies are easy-care, and your biggest job is siting them well. For reliable flowering, the plants require a site with six to eight hours of direct sunlight every day. Lilies planted in shady or partly shady areas lean toward the sun or sometimes fall over. Irrigation is perhaps the most important element of lily care. You should water them generously during their growth season, but even during winter, when they are dormant, the soil should be kept moist. They'll need feeding too. Use a high-potassium liquid fertilizer during spring and summer. Feed the bulbs every two weeks until six weeks after flowering. Another important thing to remember is to leave the browning foliage in place even when it is not attractive. The plant needs the foliage to help the bulb store the energy it needs to flower the subsequent year. Cut it down in late fall and not before. Some gardeners wait until early spring. Mulch is important to help the lily roots stay cool. Add 4 to 6 inches of new mulch just before winter to protect the soil from a freeze as long as possible. Leave the mulch on the soil until the last frost in spring is passed. Finally, you'll need to divide the bulbs every three to four years. When you see new growth start up in spring, dig the bulbs up and divide them into clumps. Replant them and, at the same time, add compost and bonemeal to the soil.